Cat Quality Undercarriage Rubber Track - Kelly Tractor Co. The amount of torque and horsepower required by an application has a direct impact on undercarriage component wear. 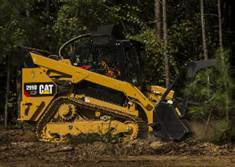 The materials you work in can have at least as much impact on the service life of Cat rubber undercarriage components as some applications. In general, the more abrasive the material, the faster components wear. For example: rocky, jagged material or construction debris will cause the most wear on undercarriage. The least wear will occur when working on soft, loamy soil or non-abrasive surfaces, such as turf and finished landscaping. Your machine’s undercarriage is often exposed to mud, gravel, debris, and other abrasive materials. Cleaning the undercarriage on a regular basis is recommended. How often the undercarriage needs to be cleaned depends on the material being worked in. A daily cleaning is normally sufficient. Cohesive and abrasive materials, like mud, sand, clay and gravel, should be cleaned out as often as possible, even several times a day, to reduce unnecessary wear to undercarriage components. The timing of undercarriage cleaning can be a factor in how easy or difficult the job becomes. It is easier to remove materials like mud at the end of the day than the next morning, when it has dried. How many hours per year does your machine run? General Duty Tracks may be the best option. 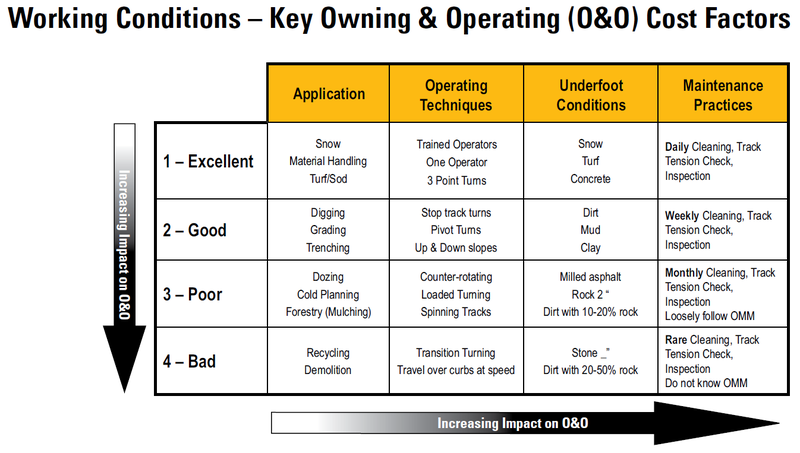 General Duty or Premium Tracks are both great options, but it is important to consider the application and underfoot conditions. Premium Tracks are the best option. How many operators will use this machine? How experienced are they? A single operator has a vested interest in taking care of his machine and operator station. -Maximized track life is highly likely. 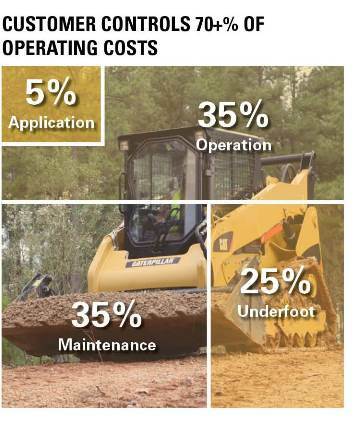 A less experienced operator may consider productivity more important than total owning and operating costs. -Lower track life may result from breakage or chunking. 1. Measure the width of the track in millimeters. 2. Measure the distance from the center of one link to the center of the next link (in millimeters). 3. Count the number of links or lugs around the full length of the track.